2001-01-05. Good. Ships with Tracking Number! INTERNATIONAL WORLDWIDE Shipping available. May not contain Access Codes or Supplements. May be ex-library. Shipping & Handling by region. Buy with confidence, excellent customer service! 1970-08-10. Good. Ships with Tracking Number! INTERNATIONAL WORLDWIDE Shipping available. May not contain Access Codes or Supplements. May be ex-library. Shipping & Handling by region. Buy with confidence, excellent customer service! Viking Adult, 1969-08-18. Hardcover. Used:Good. Collins, 1970-01-01. First Edition UK. Hardcover. Good. Thomas More Press. Unbound. GOOD. Spine creases, wear to binding and pages from reading. May contain limited notes, underlining or highlighting that does affect the text. Possible ex library copy, thatâll have the markings and stickers associated from the library. Accessories such as CD, codes, toys, may not be included. Viking Adult. Hardcover. 0670167754 New Condition. . New. New York: The Viking Press. Hardcover. Slightly soiled. . Fine. 1969. First Edition. Viking Adult. Hardcover. 0670167754 Like New Condition. . Fine. New York: Viking, 1969. First edition. Hardcover w DJ. VG+/VG. Slight fading to blue cloth board edges, bright orange spine lettering & front decoration, FO plate to FFEP, some ink underlining. Unclipped DJ ($5.95) nicked/chipped edges, slight edgewear, toned to rear, in mylar protector. Scarce. PLEASE NOTE: We are happy to provide photos. Please contact us for any specific requests. BUYING AND SELLING USED AND RARE BOOKS FROM HISTORIC EAST NASHVILLE SINCE 2012. New York: Viking Press, 1969 McGinley (1905-1978) was a poet and author of books for both children and adullts, many with a religious theme . She also wrote four collections of essays. She won the Pulitzer Prize for poety in 1961. The sale item is a collection of essays on selected saints, and explains their relevance in a modern world. Blue cloth binding with gold illustration on front board and gold lettering on spine. Binding tight and square with no flaws other than bumping at top and bottom of spine. Unclipped dust jacket is clean and bright but is worn and chipped at top and bottom of spine and upper edge of front side. There is also sunning on the upper inch and a half of the back side. 243 pages. Ave Maria Press, 1982. Unbound. Good. Disclaimer:A copy that has been read, but remains in clean condition. All pages are intact, and the cover is intact. The spine may show signs of wear. Pages can include limited notes and highlighting, and the copy can include previous owner inscriptions. At ThriftBooks, our motto is: Read More, Spend Less.Dust jacket quality is not guaranteed. Thomas More Press, 1982-01-01. Hardcover. Very Good Minus/Very Good. Very good minus in very good dust jacket. Binding is tight. A few light pencil erasures in the foreword. Jacket is bright with just a touch of shelfwear and a few small tears. Will ship (and look great) in an archival quality clear Brodart cover. New York, NY: Viking Press, 1969. Reprint. Hardbound. 8vo. 243 Pgs.. Fine. 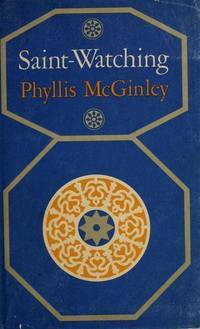 Saint-Watching by Phyllis McGinley. Published by Viking Press, New York, NY, 1969. Reprint. Hardbound, no DJ. Size 8vo (up to 9-1/2'' tall). Condition: Fine. 243 Pgs. Chapters from this book originally appeared in Mademoiselle and Vogue Magazines. Description text copyright 2001 www.BooksForComfort.com. Item ID 3496. Viking Adult. Collectible - Good. First edition copy. Collectible - Good. Good dust jacket. Viking Adult, 1969. 1st Edition 1st Printing. Hardcover. Very Good/Very Good. 8vo - over 7¾ - 9¾" tall. Very Good/Very Good. No markings to text block. Previous owner's markings on front free end paper. Dust jacket price clipped. New York: The Viking Press, 1969. Second printing, hardcover, 255 pages. A lovely clean, bright, unmarked and unworn copy in original full blue cloth binding. No inscription or book-plate, no textual markings. In a VG+ dustjacket with a little light edge-wear (jacket is now protected in a clear mylar sleeve). An excellent copy..
Viking. Very Good in Good dust jacket. 1969. First Edition. Hardcover. Worn, torn and soiled DJ. Owner's name on endpaper. ; 8vo 8" - 9" tall; 243 pages . NY: The Viking Press, 1969. Book. Very Good+. Cloth. First Edition. 8vo - over 7¾" - 9¾" tall. 243pp, A view of saints as real people rather than as mere niche-dwellers. There are tape marks on the front endpapers where the remains of the dj flaps were once taped. Former owners embossed stamp is present on the front endpaper. Otherwise a very nice and clean copy. No marks or tears in text..
McGinley, Phyllis; Louis Untermeyer, series ed. NY: Viking, 1969. 243 pp. Index, blue cloth. 8vo. Near Fine, dust jacke light wear, very good-.. 2nd Printing before publicationve. Hard Cover. Very Good/Good. New York: The Viking Press, 1969. very good hardcover with dust jacket. DJ chipped. Previous owner inscription. . Hardcover. Very Good/Very Good. London England: Collins, 1970. Hardback. Previous owners name to inside cover. Price clipped to D/J. The author's book traverses centuries and continents to show us saints as men and women, as dissenters and builders, as wits, as friends of animals, as pragmatists and dreamers, as generators of love, and as movers and shakers of destiny. Some of her favourites are studied in great depth. She presents Augustine of Hippr as Everyman, 'a man as genuine as ourselves' driven by sensual humanity, struggling to subdue his appetites; and, like the rest of us, putting off the decision to reform.With the enthusiasm of a self-appointed hero-worshipper, the author effectively shares her joy in portraying the saints as earthly beings - magnificent souls whose fiercely individualistic lives illuminate the meaning and value of life itself. 243 pp. ( We carry a wide selection of titles in The Arts, Theology, History, Politics, Social and Physical Sciences. and scholarly books etc.). 1st Uk Edition. Cloth. Very Good/Very Good. 8vo - over 7¾" - 9¾" tall. Harback. NY: Viking. Near Fine in Near Fine dust jacket. 1969. Hardcover. First edition. Lengthy gift inscription on front free endpaper, else near fine in a near fine (rubbed at base and crown of spine) dust jacket. .
New York, NY, U.S.A.: VIKING, 1969. Book. Good. Hardcover. SECOND PRINT. 8vo - over 7¾" - 9¾" tall. SLATE BLUE JACKET. 243 PAGES. LIGHT TANNING AT EXTREME PAGE EDGES, NO HARM TO TEXT. JACKET LIGHTLY RUBBED AT EDGES. TEXT IS CLEAN AND SECURE. VIKING, 1969, SECOND PRINT. 8vo - over 7¾" - 9¾" tall. New York: The VIking Press, 1969. First Edition/1st printing. Hardcover. Good. 1969 1st edition/1st printing blue hardcover with rubbed edges. Interior clean, binding secure. Jacket has light soil and rubbed edges. Professional bookseller for 20 years. Orders shipped daily in cardboard bookfolds. Viking Adult, 1969-08-18. Hardcover. Good. NY: Viking Press, 1969. DJ is bumped, browning w/edge wear, price clipped corner and small tear. Cover is rubbed. Pgs. are clean & tight.. Hard Cover. Good/Fair. 8vo - over 7¾" - 9¾" tall. Penguin Books, 1971-05-01. Paperback. Good. Chicago: The Thomas More Press, 1982. Hardcover. Dustjacket spine faded and edges lightly worn. Otherwise a clean, tight hardcover book in very good condition with a dustjacket in good condition. Green half cloth over green paper boards. 243p. A portrait of famous saints as common people with great faith and holiness. A Thomas More Book to Live. New York: Viking, 1969. 2nd ptg . Hardcover. Near Fine/Very Good. DJ by Jacqueline Schuman. 13000 PB shelf. Orange & gold-stamped blue cloth. 1971 inked note FEP, clean text. Attr. price-clipped dust jacket. Index. NY: Viking Press. Good in Good dust jacket. [c1969]. Hardcover. x, 243p. , index. .
Collins, London, 1970. Hardcover. 8vo, First Edition. Book Condition: Very Good. Dust Jacket Condition: Very Good.. The Viking Press, 1969. Very Good/Very Good. A look at those individuals who arrived at sainthood in their "human form" with all the foibles the rest of us share. 243 pp..
Viking Adult. Used - Very Good. Ships from Reno, NV. Great condition for a used book! Minimal wear. 100% Money Back Guarantee. Shipped to over one million happy customers. Your purchase benefits world literacy! Viking Adult. Used - Good. Former Library book. Shows some signs of wear, and may have some markings on the inside. Viking Adult. Used - Good. Ships from Reno, NV. Shows some signs of wear, and may have some markings on the inside. 100% Money Back Guarantee. Shipped to over one million happy customers. Your purchase benefits world literacy! New York: The Viking Press. Very Good in Poor dust jacket. 1969. Hard Cover. 0670167754 . there are the usual markings of an ex-libris book the stamps on several pages the cardholder at the end of the book, plastic cover back of DJ is heavily waterlogged ans stained (lighht brown, possibly coffe). 243 pages including index. interior of book is without any flaw. ; Ex-Library; 8vo - over 7¾" - 9¾" tall . Viking Adult. Hardcover. 0670167754 Item in good condition. Textbooks may not include supplemental items i.e. CDs, access codes etc... . Good. Doubleday. Used - Acceptable. Acceptable condition. Dampstained. The Viking Press. Good+ with no dust jacket; Previous owners name stamped inside.. 1961,1969. Second Printing. Hardcover. 8vo; 243 pages . HarperCollins Distribution Services. Used - Very Good. Very Good condition. Good dust jacket. Owner's name on endpage. Knopf Doubleday Publishing Group, 1974. Paperback. Acceptable. Disclaimer:A readable copy. All pages are intact, and the cover is intact. Pages can include considerable notes-in pen or highlighter-but the notes cannot obscure the text. An ex-library book and may have standard library stamps and/or stickers. Knopf Doubleday Publishing Group, 1974. Paperback. Acceptable. Disclaimer:A readable copy. All pages are intact, and the cover is intact. Pages can include considerable notes-in pen or highlighter-but the notes cannot obscure the text. Doubleday. Good with no dust jacket. 1974. Paperback. 0385095376 . 6.90 X 4.10 X 0.60 inches; 239 pages .